There was a time not too long ago when if you wanted to be taken seriously, you had to go to church. Going to church was the norm. That's what decent people did - so much so, even if you didn't go to church, you lied about going to church. We don't live in that world anymore. Church attendance, and church membership in particular, is no longer seen as a benefit. In many circles, it's actually seen as a detriment. While it's easy to complain about the malaise of church membership, the reality for most of us leading churches is that this is the world we live in. The question is not so much about the right or wrongness regarding church membership, but how can we be a church in the midst of an anti-church culture that is drawing people into a saving relationship with Jesus Christ? Even though our culture may be anti-church, I still believe that the local church is still the best way for people to grow as disciples of Jesus Christ. So what does the church have to do in our anti-church reality? I'm no expert, but I think here are some places to start. Get over it. We have to be a seeker friendly church. Most established churches have almost a prideful attitude that while they may be a bunch of things, they are not like one of those seeker friendly churches. Well guess what, if you're not reachable, relevant, and connecting with people who are far from Christ, you are failing in the great commission. So get over it. Figure out better ways to connect with people who are not part of the church. People aren't going to start showing up at the church. Your people are going to have to start inviting people. When people to do show up, make it worth their while. I almost want to say another "get over it" here about a consumer church. The reality is we live in a consumer world. Before you can impact people to think differently about church and about their relationship with God, you've got to get people first. And to get people to stick around, the church has to be relevant. The church has to meet needs. The church has to make a difference in people's lives. Make sure you know where you're taking people. There ought to be a plan for helping people become fully devoted disciples of Jesus Christ. It doesn't just happen by being around church. There's got to be a plan, a plan that works. One thing I know for sure: whatever it is your church is currently doing, it is perfectly suited to produce the results your church has been experiencing. 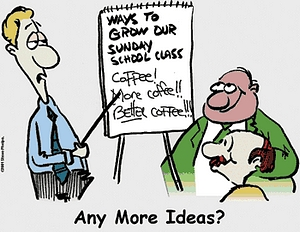 If you want different results, you're going to have to start being a different kind of church.